The Boston Bruins got a very unique experience over the past few weeks, heading to China for a week of practice, bonding and a pair of preseason tilts against the Calgary Flames. Boston is leaving China with two victories over the Flames, but more importantly, they are leaving ready to roll for the 2018-19 season. 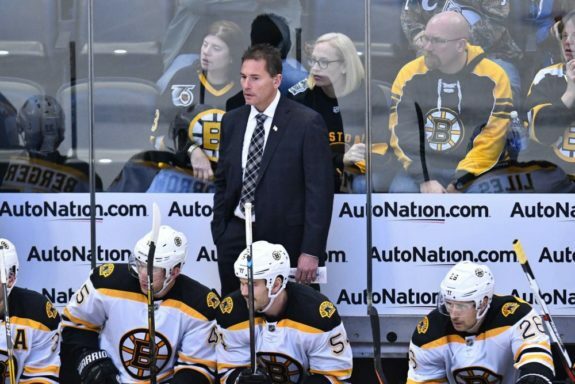 There will be no catching teams off-guard this season – the Bruins have everyone’s full attention. As Bruce Cassidy and friends return to Beantown after a 13-hour flight from China, they arrive to a roster finally taking shape and a team looking poised to repeat last season’s almost-unexpected success. I thought it was a really nice touch by the Bruins to add goaltender Derek Dun, from British Columbia but of Chinese descent and playing for Kunlun Red Star, to the roster on a PTO earlier this week. Dun obviously didn’t play, but the news played really well in China and certainly helped a bit with the growing of the game. When a young Chinese boy or girl sees that, they know that just because hockey isn’t mainstream there it doesn’t mean they can’t pursue their dreams. Tip of the cap to the Bruins for that move. In terms of the on-ice production, I think people have to be happy. Tuukka Rask made one mistake in Game 2 that led to a goal against, but I thought he was really strong Wednesday morning. Rask stopped 28 shots in the victory and looked in mid-season form. If the Bruins are going to be an elite club again this season, they’ll need Rask to be himself. He was just that in the 3-1 victory. 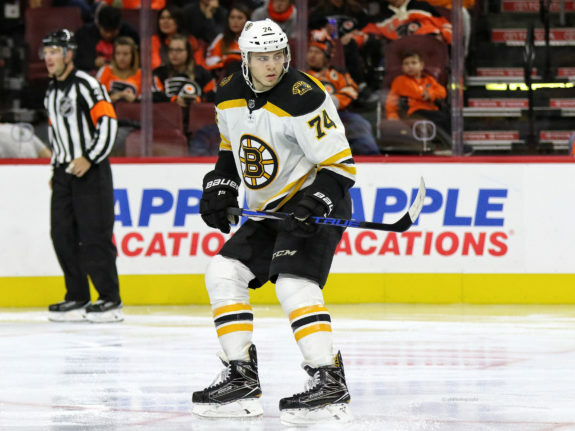 In terms of breakout players, I think Jake DeBrusk has to be at the front of the discussion this season. The Edmonton native scored twice, including the game-winner, on Wednesday morning after scoring the shootout winner early Saturday morning. He was terrific for the Bruins in China – in fact, I think he was their best player. The line of Ryan Donato, DeBrusk and Jacob Forsbacka-Karlsson was strong on this trip and I think it would be wise for Cassidy to try them again when they return to action at home. If this trio can mesh well and produce, the Bruins could run three legit scoring lines this season. I’m not saying it will happen, but when you have the chance to have that kind of firepower you have to take it. John Moore looked good to my eye, while Trent Frederic looked a lot closer to NHL ready than I would have thought. Frederic, a strong two-way forward, could push his way into roster discussions over the course of the next week and a half. 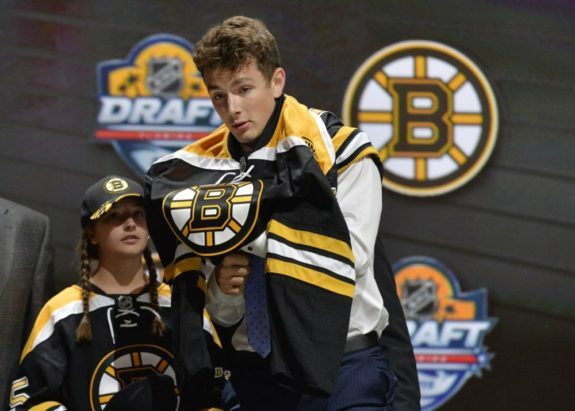 When the Bruins selected Jakub Lauko 77th overall this past June, you probably didn’t think twice about it. You’d be right not to – after all, third-round picks usually take anywhere from three to five years to make the NHL, if they ever do. Lauko has had other ideas, however, and took the Boston group by storm early in camp. Lauko scored Boston’s only non-shootout goal on Sunday and then added another tally on Tuesday night. Zach Senyshyn has been labeled a bust by a lot of Bruin fans, but don’t sleep on him just yet. The 2015 first-round pick scored twice on Tuesday night and has looked very good early in the preseason. His AHL stats a season ago don’t pop off the page -12-14-26 in 66 games – but he was a lot better by eye and adjusted well as the season went along. The Bruins are in need of scoring depth up front and Senyshyn has the skill set to fill that role. It might not happen on opening night, but don’t forget about him as the season wears on. Sean Kuraly, Daniel Winnik, Wiley Sherman and Steven Kampfer all looked strong to me as well. In Winnik’s case, he’s still fighting for a contract as he is in camp on a PTO. I think he helped his case while most of the NHL roster was on the other side of the world. The B’s did make some cuts on Wednesday, as 12 players were sent packing. There are no real surprises here except for the fact that Fayne was cut. I thought he had a chance to earn a spot in Providence and potentially a contract as a depth option. With his release, and the fact he isn’t on the P-Bruins camp roster, I think we can assume that his time with the organization is already over. The B’s now have 30 forwards, 15 defenders and four goalies on their camp roster. They’ll need to get down to about 14 forwards, seven defenders and two goalies in less than two weeks so we can expect another big wave of cuts coming soon. That likely happens after Boston’s Saturday night preseason tilt against the Detroit Red Wings.